WinAVR will install the GNU Compiler and a ton of useful utilities. For those with Windows 8.1, a problem and a fix has been reported. 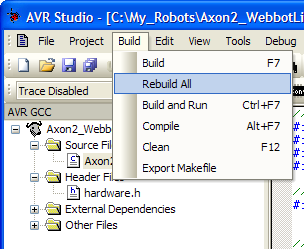 AVR Studio is an IDE, assembler, and programming software all in one. When you want to write and compile code, this is the software you will be using. Install in this order (SP2 is not needed). Further AVR Studio upgrades (untested by SoR) can be found on the AVR Studio Download page. Or for direct links to download tested upgrades go here. Because AVR Studio is not compatible with Mac or Linux, you might find this post and this post helpful. If you use Vista 64 bit, read this and this. And here are instructions for programming the Axon using Ubuntu. 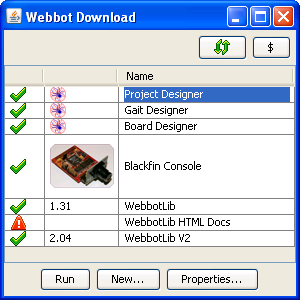 WebbotLib is GUI-based software that writes all the low-level code for you. It's very easy to learn and use. Double click 'Project Designer' as highlighted. In the new window that pops up, tell it where you'd like to install this new program. Do the same for 'WebbotLib V2' at the bottom. The other programs are optional. For additional help/instructions, please see the WebbotLib Downloader page. Everything you need to know about WebbotLib is in the WebbotLib pdf manual found in the folder you saved WebbotLib V2 at. In WebbotLib Downloader, you can also click Run for WebbotLib HTML Docs. WebbotLib is updated regularly - always try the latest version before reporting a bug. To keep updated, subscribe to this forum thread, but DO NOT POST SUPPORT QUESTIONS IN IT. Follow the official Project Designer instructions to finish your new project setup. In this step, we will run AVR Studio. After generating code, go into the new code folder that Project Designer created for you. Look for a file with the extension .aps, and double click it. It will then open up AVR Studio for you with all the required configuration settings you need. The final programming step is to compile the code. This converts your code written in C to machine code in a .hex that only your specific microcontroller can read. You should do a Rebuild All the first time you compile the downloaded source code, if you manually replace any program files, or if you modify the generated files using Project Designer. Otherwise, use the faster Build command. If you get errors, and you are new to programming, it may be a little difficult to debug at first. Go back and check to make sure you followed all the steps, especially properly naming the files (a common error). 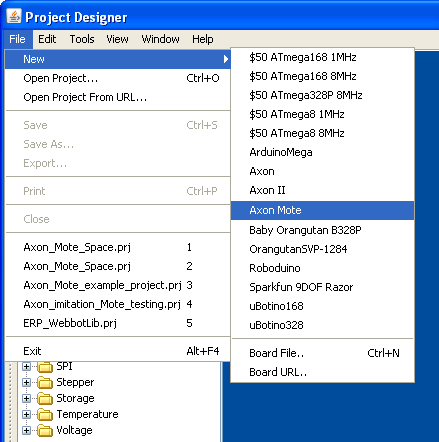 A new .hex file can be found in your project folder. 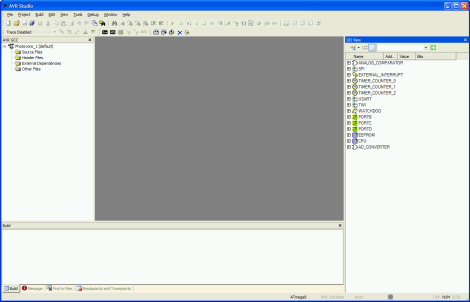 This is the compiled program that can be uploaded to your microcontroller. Whenever you modify your program, just click 'Build' and it will recompile a new .hex for you. Don't forget to Save before recompiling. Make sure your makefile specifies the output .elf file as [your project name].elf"
If you get that error, it means you made a mistake naming your files. For example, do not put in spaces in either the file name or the file directory. 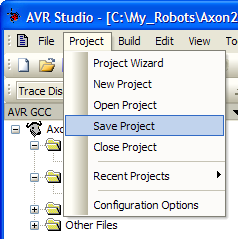 Lastly, save your project configuration.